What's white, looks like a cloud and is tipped as a top yummy food to eat in 2015? No, it's not one of my Mummy's rubbish jokes, cauliflowers are big this year so why not join me in trying to grow some? Wow, who knew cauliflower came in so many colours? 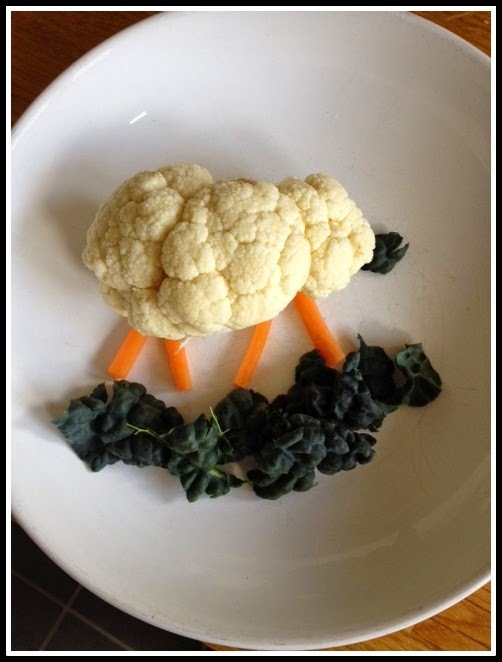 As well as growing them I've got a tasty family friendly cauliflower recipe that you can help make and everyone can enjoy. Their name means cabbage flower. Cauliflower can grow to a HUGE 75cm in height and width. If you cut one in half it looks like a tree with the main trunk dividing into many small branches which end in a mass of ‘curds’ (which are really just teeny tiny stems). The outer leaves ensure development of a white head. Without the leaves growing around the main plant a bunch of yucky inedible yellow flowers would appear. You can eat the leaves (they're good in casseroles & soups). 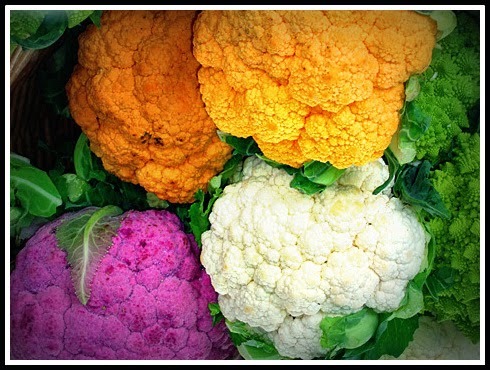 Most people only think they come in white varieties but green, purple, orange, brown and yellow cauliflower can also be grown. Cauliflower is really, really good for you. It contains lots of fibre to help you poo (I said poo!!) It also has lots of anti-oxidants, vitamins (B, C & K) and minerals (manganese, potassium & magnesium) to help you stay fit and healthy. Or you can grate them to make "cauliflower rice" or mash up and made into pizza base or just mash as an alternative to potatoes. Cauliflowers can be expensive to buy, so they are a great crop to try to grow at home. Plus they can be grown all year round. They aren't the easiest crop though, so you do need to be super organised before your start. They need a large space, lots of water and non acidic & deep soil. Make sure your soil is lovely and rich by digging in some stinky manure first. You can start some seeds now for a summer crop. Sow seeds 0.5cm deep and keep watered. transplant to 5cm apart once big enough to handle easily. When they're 10cm tall they are ready to be planted outside. They need 60cm between them and to have lots of lovely water, especially when they are just starting off, and then every 5-7 days. They also really like to be fed with a fertiliser that has phosphate in it. They are ready when the white head is firm and about 15cm in size. If the florets start to separate in the head you've left it too late. Once you harvest the main head you can still get smaller side florets which are also yummy. Club root- roots go all funny shaped, leaves become pale. Poorly plants will need to be burned. You need to make the drainage better, add lime to make soil more alkaline. Birds- Pigeons love to strip the leaves from growing plants. Cover your plants with a net. Caterpillars- try bending over some leaves to protect the heads. Break the cauliflower into florets and steam for 8 min. Set aside to cool down. Finely chop the onion and gently fry in a little bit of oil until softened. Set aside to cool. Finely chop the cooled cauliflower and place in a large bowl. Add all the ingredients (including cooked onion) and mix well. Place bow in the fridge for 30min to allow mixture to firm up. Turn the croquettes over and place back in oven for another 12 minutes until crisp and golden. Have I converted you to liking cauliflower yet? Even Daddy who claims not to like cauliflower though these croquettes were tasty and is looking forward to eating some made with our homegrown cauliflowers. Let me know if you grow some this year too.